If you've ever had a cocktail party, small gathering at your home or a large event, then you know the little details are what many remember and ask about. 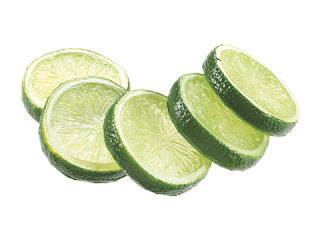 We have an overstock on artificial limes and that means super savings for you. We've just added them to our managers special page and once they're gone they'll be back up to normal price. Use them as décor or make something creative out of them to accent the special event you're having. Another use for them is to place them in a glass vase in your kitchen for a fresh cut lime look that will last for years. many of the designers we work with like to suspend these is our Quickwater artificial water product. It's easy to do and you'll get a look as if they are floating in a glass of real water. We've had customers tell us that when they put these out, they looked so realistic that one of their guests placed one in their drink. Now that's what I call a realistic looking artificial fruit. To view our artificial limes on special click on the link below. Artificial Limes on Managers Special Click Here. 2 new Japanese bamboo silk trees have just been added to the Manager's Special Page. One at 5 feet tall has 12 real bamboo trunks and 2,400 leaves to make it a very full tree. The 6 foot version has 15 natural bamboo stalks sprouting over 3,400 leaves making these some of the best quality bamboo trees on the market. The last time we had something of this quality it was only listed for an hour and a half before it sold out. Don't wait, go now to get you special one time sale. It's first come first serve and when they sell they are gone forever. We will post this to our Blog, Facebook, Twitter and Pinterest followers first so they will have first notification of this and get the first crack at securing this great deal. Purchase your bamboo tree by clicking here. 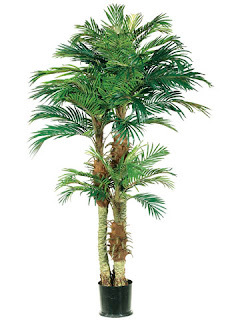 We just added 2 of these imperfect artificial phoenix palm trees to our manager's special page. 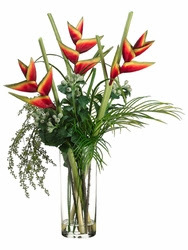 We add new items every week and could be anything from one silk flower stem to silk palm trees and more. New item will be announced to our blog, facebook and Pinterest followers first so you'll get first crack at the items. Make sure you follow us and if something comes up that interests you, don't wait because chances are it will be gone the same day we post it. 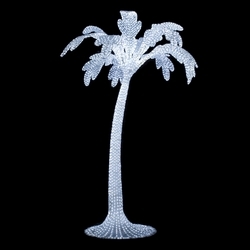 Browse our current selection of great deals including this palm tree on our manager's special page by clicking here. For nature lovers, the idea of having artificial plant and tree displays instead of live ones can cause a negative reaction. After all, the draw of plants, in all their intricate beauty, is that they are natural living things. Because caring for them entails so much effort and time, most people hesitate and think twice about keeping plants in homes, although they add so much aesthetic value. However, nobody wants to invest so much on things that quickly wither and die, right? Here’s where artificial silk plants and trees bring the most benefit. What are silk plants and how do they enhance a home’s appeal? Topiaries bring a sense of earthly beauty inside homes. What’s great about them is that they can be placed practically anywhere, whether by the window side, on a table, on a shelf or at a corner of your choosing. From the subtle undercurls of petals to the delicate interspersed sprays and ferns, silk arrangements of good quality can fool even those with the most discriminating and sharpest eyes. Some flower arrangements even come with oils and wick that add fragrance indoors. Bushes are most commonly placed outdoors as a means to enhance landscaping. What’s great about silk bushes is that they “greenify” exteriors all year round and are flawless imitation of the real things minus the need for garden gloves and watering. Vines or hanging plants are best placed outdoors, by the windows or by the well for that colorful fall or winter look. Silk hanging plants are the best solutions for window boxes that are usually hard to water. Perfect for sprucing up these window boxes and planter arrangements are artificial grasses, the vitality of which remains outstanding regardless if it is raining or the sun is shining. Cacti and succulents bring in this desert vibe whether inside or outside homes. Popular iconic breeds include columnar, saguaro and beavertail artificial cacti. What is not to love about silk trees? They are natural-looking, with most handmade out of polyester or premium silk. Silk trees also come in several varieties and range in size, from small to giant. From the petite clusters of palms to the towering giant palm trees, these faux plants bring in a taste of the tropics to any gardening climate. Silk palm trees simply are versatile additions to any landscape design. Silk bamboos are great alternatives to live plants. They are not only convincing with how they look but are also non-discriminatory in terms of climate. Regardless of distance or proximity from the equator, bamboo trees work well with any landscape. Silk ficus trees come in burgundy, green and variegated types. They place very well whether inside commercial, home or office spaces. No need to worry about potting, dead foliage and water droppings on the floor either as artificial ficus trees are just lovely faux plants perfect for convenient enjoyment. Other excellent options that bring charm to home, outdoor and commercial settings are silk willow trees, Japanese bonsai trees, and Ficus topiaries. They all give a distinctive artistic flair whether you choose to place them on bare tabletops, shelves, by the windows or corners. Silk plants and trees come in a variety of colors, materials, sizes and shapes. It is important that decorators and home owners carefully decide on their preferred selections based on their décor needs as well as the target setting. Everyone would want to keep and stay in a place that looks good. It’s always great having a house with awesome decorations that bring in and retain a timeless beauty. With live, natural plants, however, this simply isn’t possible given the effort for care they require as well as their limited life. This brings homeowners and decorators to instead consider the use of silk plants. What’s great about silk plants is that they come with a sense of natural beauty minus the hassles that live planting demands. Not only do they look real, but they also come with elegance that provides settings the best looks possible. In addition, wide ranges of collections can easily be found everywhere, most abundantly online. 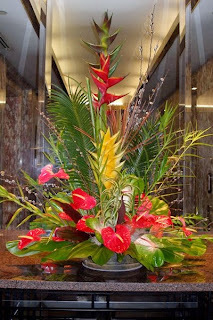 Plants always bring in an excellent look whether for home, office or commercial settings. simply add in a tranquil and natural feeling onto the atmosphere, making homes more attractive, likeable and welcoming. In addition, they are perfect for enhancing color and giving rooms vitality. Sometimes, a simple flower pot makes for a perfect solution for a cold-looking, empty corner. You might even want to add in some natural lighting to that, if you want a more emphasized dramatic effect. Artificial plants for indoor use bring in a sense of harmony inside homes. Perfect for the oriental or the minimalist feel are sticks and bamboo cranes. Artificial bonsai trees are great options as well although they might come quite pricey. For outdoor use, artificial plants bring the advantage of extending appearances to greater prospects. They are the more convenient options as they don’t require extensive maintenance as live plants do. Because they look very natural, it is also rather easy integrating them with any existing natural landscaping. Placing silk plants decoratively on front porches can work wonders. This won’t only scream “homely!” in the eyes of passersby, but will ultimately enhance the outside looks of homes. The same goes for positioning these decors right outside windows or hanging them by the door. Hanging vines also bring great focus on outdoor elements, such as wells. Silk plants can be perfect décor alternatives for occasional events as well. Many professional designers have started to consider the use of artificial plants and trees for enhancing venues they prepared for their fashion shows and other activities. They are great replacements for live plant decorations during weddings or birthday parties as well since they don’t cause falling petals or leaves which guests may view as venue clutters. There are a lot of people who have this surging love for nature and plants but may not be able to keep even one in their homes due to certain circumstances. Live plants require extensive care and not many may have the time for it. What to do? Give them silk plants as gifts. For sure, they will more than just appreciate the gesture. Vases of branches add in vertical elements, creating drama when placed in corners whether of bedrooms or living rooms. They may even be spray-painted with unnatural colors as neon pink or bright orange to have them appear as though they are post-modern pieces of art. Some creative fashion enthusiasts even convert these into functional art by hanging ties and necklaces from branches that are attached to the wall horizontally. Really, there are an infinite number of things that you can do with artificial silk plants! All it takes is thinking out of the box when considering what you want to make of them. Decorating with artificial silk plants used to be limited to the realm of waiting rooms of tacky doctors. Well, not anymore! Many home, office and even restaurant owners now consider the idea as these elements really are excellent additions to spaces. As for selection, artificial plant decorations these days have gone past the plastic roses that come with clear glue made to look as dew droplets. Options are now infinite from origami stems, cream-colored cacti, quilted daises even to giant faux houseplants. Silk plants are indeed growing in popularity. Highlight their beauty further by learning these essential décor tips and tricks. Artificial trees are best for areas that sustain high-traffic or for grand occasions like large parties wherein the feeling of luxury is the main focus. They can be made to soften the atmosphere in conference rooms as well. Covering artificial trees with natural lighting will create a sort of enchanted evening feel. This can be great for children’s bedrooms where crafted birds can be placed alongside the plant piece. Hanging on them stuffed animals can make for an evocative and happy play space as well. For a 1950’s cheery and vintage feel, vines of red, yellow and hot pink rosebuds can be winded around curtain rods. These also work well when attached to front edges of open shelves for the space to come off playful, sweet but unpretentious. Flower chains made of tissue paper enhance eclectic living rooms and also add vibrancy to birthday dinners. Silk sunflowers may be draped as garlands inside children’s bedrooms to get that sunny garden look especially when against walls colored grass green. Nothing else speaks modern than porcelain artificial silk plants. Track down pieces that look unusual and high end, with organic shapes that will get you the taste level you desire for that modern feel. Origami flowers are great natural, enduring centerpieces especially when placed on wooden side tables. For a more artsy or crafty feel, go for giant versions and place them in an old metal pitcher. A single, painted wooden flower can hold well on its own when placed on a desk as well. What’s great about this is that you don’t even need to coax it to get it to bloom. A white window box that’s brimming with bright artificial flowers is certainly not a thing of an average homeowner. However, for the artistic spirit, there is great potential to have these synthetics bring to light dark corners and even make over-the-top statements that can induce warm smiles even from the most conservative neighbors. o Unlike live planting, silk plants do not cater to insect habitation. o There is no need to look into regular care as with watering or fertilizing. o Silk plants can be changed easily. They can be stored or removed anytime. o They don’t wither and hence, lasts longer than live plants. o You won’t even have to make issues out of changing weather conditions. o No need to worry about them causing allergies. o Dirt and dust can easily accumulate on them. But with a spray of silk plant cleaner, this problem can easily be solved. o They do not aromatize the same as living plants. o If you are not careful with your selection, you can get one with a very fake appearance. By simply looking at the improved similarity to real plants, artificial silk plants are indeed an excellent choice for home decoration. They are no fuss and no muss solutions which make sense especially now that people are much busier than ever. Carefully choose a good selection that you need based on your purpose and you’ll most certainly end up congratulating yourself for the good investment. Silk and artificial plants are becoming more and more popular and even trendy in some cases today. Many high end hotels, resorts and designers are using them in special circumstances. Some plants are just not the color you’re looking for and may be hard to maintain in certain areas of the world. 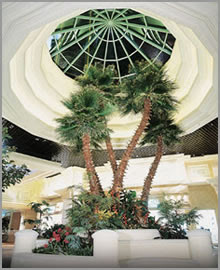 For instance Las Vegas is a prime example of the use of artificial plants. Las Vegas is in the middle of the desert and real plants are hard to keep alive because of the extreme temperatures and intense sunlight. 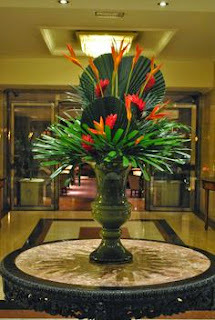 Many hotels are using outdoor artificial plants in the décor around the hotel inside and out. Most people walk right by them not knowing they’re artificial. One example is the Mandalay Bay Hotel and Casino, they have a cluster of artificial palm trees in the area where you enter into the shark aquarium and many people are sitting right next to it thinking they’re real. My point is the craftsmanship of preserved and artificial plants are much more detail oriented than they were just 15 or 20 years ago. The most common way to make artificial plants look more realistic is to mix them in among your real plants in your yard. Caesars Palace and Treasure Island are doing this in their landscaping indoors and out. Planting some artificial flowers and plants around the base of a real tree makes people not even think twice about if they’re real because they just assume they are. If you’re going to use artificial plants outdoors we recommend using something that is rated for outdoor use and UV treated. 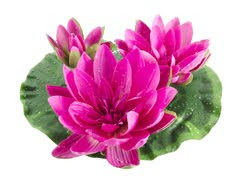 Many companies such as Krylon and Rustoleum have come out with a UV protecting clear coat spray that you can use on normal silk plants to help them last longer but the poly blend UV infused artificial plants will always out last the silk versions. A typical poly blend artificial plant that has UV protection infused into the material will usually last approximately 7 – 10 years where as the normal silk plants with UV spray may only last 1 – 2 years. Of course this depends on the amount of sun the area is getting and how intense the sun is in your area. Some of the uses for artificial plants where real plants are just not an option are listed below. Also take a look around and see if there are any areas you would like to get rid of your high maintenance plants and replace them with artificial ones. • Apartment building balconies: Watering is hard for apartment buildings and placing artificial plants on a balcony allow you to have some privacy along with a serene place to relax and have your morning coffee or tea. • Hotel lobbies: As we mentioned before hotels and resorts are implementing artificial plants into their rooms, lobbies and room balconies to save maintenance fees and upkeep all while maintaining beauty. • Outdoor landscaping: From homes to businesses, many are swapping out their live landscaping for artificial, no water guzzling plants. This eliminates the high costs of gardening and water providing more profit to the hotels owners. • Pool decks: Many are placing artificial palm trees and plants around their pool decks. UV inherent products are recommended for this purpose as pools tend to be in the sun most of the day. • High shelving in your home: many of us have high ceilings and shelves that may look bare. Real plants are just too hard to water in these areas because they’re hard to reach. These are perfect places to incorporate artificial plants. You will only have to clean them about twice a year as compared to every other day of watering real plants. Many of these uses are just the tip of the iceberg so be creative and look for different areas you can use them. There are many different qualities of artificial plants and you don’t want to go down to your local craft store to buy them. Sure, they may be cheap but they will look that way too. It’s better to spend a bit more to get some quality silk plants because they will not only look better but will last much longer also. If the artificial plants look good to you and fits with your décor, then go ahead with it. Interior and exterior home design has become part of our lifestyle and comfortable living. Absence of home decorations would feel like we are living in a cage than a home. Hence, more homeowners and designers incorporate artistic decorations to improve the feel and atmosphere of every household, including office and business facilities. The sun’s heat during summer can raise the temperature in your house. So, how do you prepare for the warm season? One of the best things that you can do is to change the outlook of your interior to improve the composition, feel, and atmosphere of your home. There may be some home designers who frown on using artificial trees, but when used creatively, it is definitely a décor you should not miss. The good thing about these plant decorations is that they offer less maintenance and are more affordable. Most importantly, they do not die. Their unchanging lush green color is exhilarating and cools down the mood. Hence, artificial trees are ideal choices for decorating your home, especially during summer. There are several types of artificial palm trees in the market. They come in different kinds of green hues and forms. One of the most popular is the bamboo palm tree. It is perfect for almost all kinds of environment and it blends well with other decor. Whether you are choosing for a Japanese accent home decoration or tropical feel design, bamboo trees can easily blend with the overall concept. Areca palm tree is also popular. You can see it in many offices and hotels. However, this type of decoration is usually placed in the corners of the building. Not because it is not important, but it serves a purpose. Due to its dense foliage, it can be used to hide wall corners, especially the areas where electric outlets are in place. Kentia palm trees are also a common decor piece in commercial establishments. It's usually combined with other artificial trees, such as parlor palms, cycas palms, Chinese fountains, cane palms and areca palms. This type of artificial plant is usually placed in the house as its form simply lifts the atmosphere of the surroundings of your home. It features dainty, elegant, and lush green leaves that abundantly grow from the branches. Its lush foliage cascades around the stem, forming a perfect shade area below it. During summer, this tree can be incorporated in your home design to create a serene look to your rooms. However, if you have smaller spaces, you can choose the smaller ones so that it won’t take up a huge amount of space. Cherry blossoms are great for summer, not just because it offers shade but its color can instantly turn your surroundings into a cool summer environment. Typically, it has a pinkish or reddish color however you can also find white or cream colored blossoms. You can base your color choice on the design of your house. • Do not throw your artificial plants away after the summer. Instead, rearrange them in different areas or place new decorations on them so they would not look boring. Lights are a great option for decorating during the winter months as they add a glow and certain ambiance when you have guests over. • Recolor them to new hues if you wish to use them for celebrations and other occasions. You may even use your palm trees for Christmas, many are now using them as Christmas trees. Plus, trees can be cool decor for Halloween parties and decor. • Use your creativity so that they will be put to good use instead of just throwing them away. These trees can be very tranquil and serene for those who are not living in tropical areas, but want to make an equatorial feel of their homes. You may have already decide on what type to buy and where you want to place your artificial tree. In this case you're ready to start your project, if not you can start at the page below to view our collection of quality artificial trees. 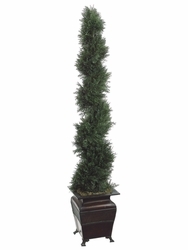 To view our huge selection of artificial trees click here. From the fake varieties that were so popular in the past, silk flowers have come a long way indeed. Those faux blooms that can easily be identified as plastic has given way to more real-looking leaves and petals which is why more home owners are applying this kind of décor to their homes. Aside from the realistic look, silk flower arrangements are also inexpensive hence many individuals find it ideal for their interior and exterior decorating needs. By using the right vessel such an empty tin can or the typical vase, you can create a great centerpiece arrangement for the spring or summer without so much effort. Incorporate craft items already in your house and buy some silk flowers, then you are on your way to making a seasonal, stylish silk flower arrangement that does not ruin your budget. The result is a suitable decoration without having to dent your wallet. Don’t get easily frustrated though when you have difficulty cutting the stems because of their thickness. When you know some tips and tricks on how to decorate with artificial flowers, you are most probably going to get hooked with the activity simply because it is fun and enjoyable to do. The following are some guides on how to go about your spring or summer silk flower arrangements. 1. If you are planning to create something big, you should ensure that the base is strong to hold the arrangement properly. So instead of the usual foam, use floray clay as they are ideal weight additions because they are heavier and of course, can withstand heavy silk flowers compared to foams. 2. Even though there are types of silk flowers that are easy to bend as they are made from wires, there are still really thick stems that are a pain to cut. For this, you need to buy a sturdy wire cutter in order to work smoothly during the cutting phase. With the wire cutter, you can make a cut mark on those thick stems and then bend them backward and forward until it gives. 3. In summer silk flower arranging or with any other season, the appropriate way is to cover the foam or in large arrangements, the floray clay, with moss. 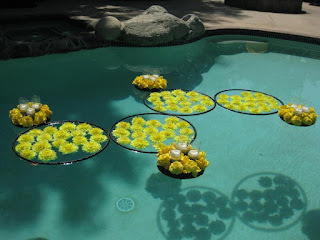 To do this, you can use spray glue on the weight materials, then cover them with moss gradually. 4. Have a concept on what your arrangement will look like before inserting the silk flowers. Determine which types of flowers will go at a certain location and how they will appear. After you decided on the basic design, you can then bend the silk flowers based on your desired look and then start inserting them. But don’t take this for granted, insert the big flowers in the focal area and the smaller ones on the sides. 5. For the ideal artificial flower to incorporate in your spring/summer arrangement, get silk hydrangeas and make them as your focal point. You can paint your vase or can with an acrylic paint that is light blue. After letting the paint dry thoroughly, you can put some silk hydrangea blooms inside the vessel until it is full. A few silk sprigs of greenery should be on the inside and let them drape over the sides for a classic look. The art of decorating with silk plants is no longer confined only to a clinic’s waiting room or a small business office. These days, homeowners can very well use the creativity that can be inspired from artificial plants. They add texture, warmth, color and excitement to any space without the hassle of maintaining a real plant. It also lessens your chores because you do not have to keep a schedule with watering and re-potting duties. Plus, silk plants can either be placed in dark areas without the worry attributed to living plants. Interior living rooms, windowless bedrooms and dimly lit offices can now be brightened by silk plants, the same way that living ones enhance a space. But how do you start decorating your home with silk plants? Below are several suggestions. 1. Decide on a theme first or if you prefer different themes for various rooms, go on and plan them out beforehand. If you want a country cottage effect for instance, you can buy pansies, miniature roses, geraniums and other flowers that are normally found in a garden. For a tropical theme, you can go for hibiscus, birds of paradise, a banana tree, bromeliads and even a rubber plant to complete the lush, warm look. But if you want to have that streamlined contemporary ambience, get ficus trees, lilies, orchids and many other kinds of foliage plants. 2. To complement different room sizes, you have to get a range of silk plants in a variety of sizes and shapes. Set off your entryway with 2-3 large silk plants like a pair of sword ferns for example. On the base of your stairs, you can put another large plant such as a palm tree or you can make it as a divider between the living and dining room. 3. Another ideal use of large artificial plants such as ficus trees is to make them as a room screen between areas in an open floor. For instance, you can line them up (5-8 plants) between your dining room and home office. These large plants can also serve to set a tone of privacy for certain spaces such as in an entertainment area to give it a different space from the whole of the living room. 4. Counter tops and tables can be accented with flowering silk plants in groups of three or you can place them individually. You can put three orchids on the mantel, one bromeliad on a corner table or arrange your favorite flower plant to any of these furniture pieces. 5. For the bedroom, you can decorate according to its colors. If your daughter’s room is pink, you can pair it with a pink azalea. If your boy has a blue room, you can go for a blue orchid and for a peach guest room? 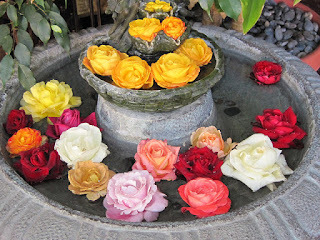 Go for a peach hibiscus and other flowering plant with a peach related color. As you can see, decorating your home with silk plants do not have to be difficult; you just need to stretch your creativity a little and you’ll have amazing rooms in no time! Traditional silk flowers will fade within a few months after placing them in an outdoor setting but not these. 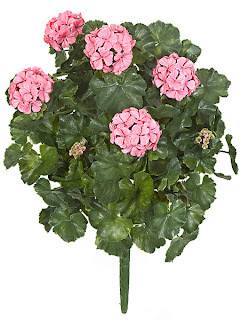 After popular demand from our customers, we have added a new line of artificial geranium flower bushes to out outdoor line. These geraniums are made from a durable poly-blend material that is UV protected and will fend off the harsh weather and sunlight. These have been tested and are featured at many hotels, resorts, amusement parks and homes across America. Great for low light areas along with climates that moisture is at a premium. We offer them in three different colors including pink, red and white. Mix them in with live foliage for an even more seamless look to your garden. To See them in more detail click here. Many of us love to make our own arrangements and would like to use our own decorative vases to display them in artificial water. The problem with this is that almost all of the artificial water and acrylic water on the market is permanent and will ruin the vase. We’ve now come up with a version that not only looks like real water, but also is re-usable so it won’t ruin your vase and you can change your arrangements with the seasons. Craft water is a gel like substance that will harden just enough to hold your arrangement in place all while giving the crystal clear look of fresh water. When you’re ready to change it out just heat it up and it liquefies again. For those of you that have never used this product, it’s as easy as making microwave popcorn. There are two methods for using this product, one is to heat it on a stove top and the other is microwaving it. I prefer the microwave as it is much more convenient and a bit faster. If you’re trying to reuse the water after it has already been in your vase you may have to use the stove top method if your vase doesn’t fit in your microwave. 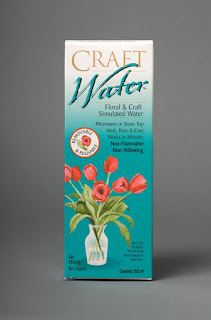 For a simulated water effect that won’t ruin your favorite vase, you’ve just found the right product. To purchase Craft Water some specialty shops and some hobby shops will carry a version of the same thing. If you’re like us and can’t wait for spring and all the colors it brings then you can start early with our newest line of outdoor artificial flowers. 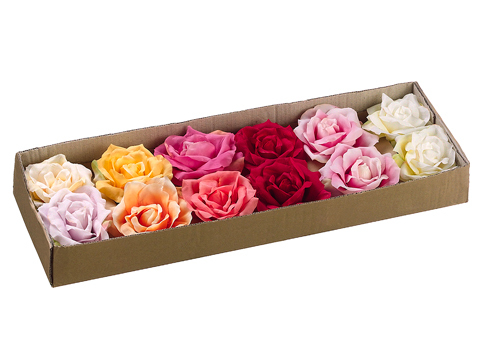 We’ve just added a new line of the fake versions of the real flowers like you’d see them growing in the spring. Your neighbors will wonder how you get your flowers to bloom so early but they may never find out that they’re artificial. Each one is made of a poly blend material to withstand the harsh weather and is infused with UV protectant so they will last you for years without fading. Decorate your front yard by placing them around the planters or purchase some of the hanging flowers if you have planter boxes. These outdoor artificial flowers work well if you have planters on your windows where it’s hard to water or maintain them. Plant them in dirt to give them the most realistic look possible. Use some of our outdoor greenery in between them to fill in the blank spaces and your home will look great with no maintenance whatsoever. If you have real flowers at your office entry then you may want to think about changing out those costly live plants with some of our outdoor artificial flowers. Since these are UV protected they will save you money over the long term. This will eliminate the need for water, repairing broken sprinkler heads and replanting on a semi-annual basis. If you would like to visit our page of outdoor artificial flowers click here. Have you ever look at a flower arrangement and wondered if the flowers in the vase were freshly cut and placed in water? Then as you walk closer you realize that it is a silk flower arrangement set in acrylic water. Then there are the ones where you can tell right away that the water is fake and thus the flowers must be artificial. The acrylic water is yellow and the flowers are dusty making the arrangement look dull and very fake. If you've ever seen this you've probably stayed away from silk flower arrangements because you thought they would be a dead giveaway that they are not real. Many people feal the same way and the typical arrangements you see at your local craft store are just not the best quality on the market and are marked up so high that they just can't see spending the money for the quality. With todays technology the silk flower arrangements are looking more and more like the real thing and in some cases are hard to tell unless you touch them. Many of our tropical silk flower arrangements are set in artificial water inside a decorative glass vase making them look like they've been freshly cut. The problem with lower end silk flower stems is that the flower looks nice but the stem itself looks very plastic and unrealistic. Our arrangements are prepared with this in mind and we only select the highest quality stems for our silk flower arrangements that are set in liquid illusion making every single on a piece of art. They may be a bit more expensive that the lower quality counterparts but you're guests will be impressed at the realism and watch as they touch them to see if they're real. In some cases we'll use real touch silk flowers so they may not even be able to tell the difference even when they touch them, how awesome is that? 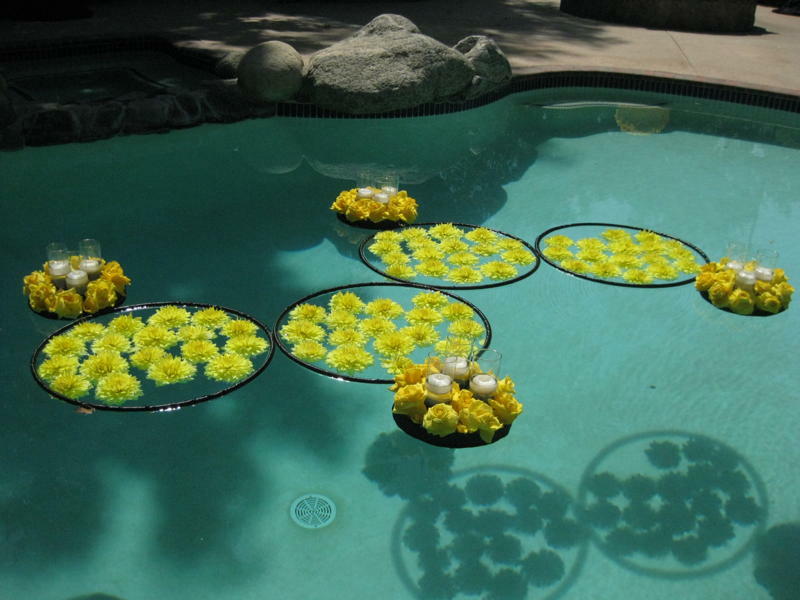 Click here to view our selecetion of silk flower arrangements set in artificial water. Artificial cactus has always been one of the unique products that we carry however now we are starting to carry artificial cactus arrangements that have been prearranged. By popular demand certain types of cactus have been added to these arrangements. Cactus gardens generally have a variety of cactus colors, sizes and heights where some may have just one or two cactus set in a pot for a cleaner look. Here at Quality Silk Plants we carry a large variety of artificial cactus so you can make your own creative garden or you can browse our selection of artificial cactus arrangements which are premade and ready for display. If you have southwestern decor, there is no better way to display your artificial cactus than as a centerpiece on your dining room table, a window in your kitchen or on a fireplace mantle. If you're not looking to make your own, you should take a look at our newest premade cactus and succulent arrangements by clicking on the link below. We know that winter is still in full swing however, spring will be here in no time at all. Filled with magnificent colors and smells, spring is our favorite time of year. Planting flowers can be a risk as we all get those late season freezes and snow storms that can wreak havoc on them making more work. 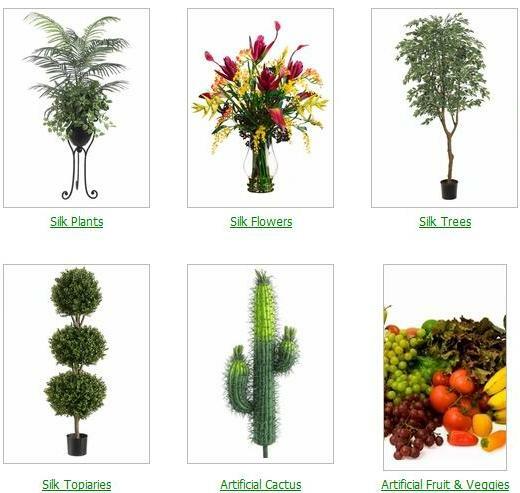 Here at QualitySilkPlants.com we've searched high and low to find the best quality and selection available on the market. Use silk flowers in your decor to eliminate the hassles but still give you a look of spring, all year long if you choose. Not real good at making your own arrangements? Don’t worry because we have hundreds of premade floral arrangements ready to display right out of the box. To view our selection of silk flowers now, click here. When you think of contemporary you think clean concise edges, well manicured and definative shapes. Many apartment owners in the large cities use this method of decorating in their homes because of the uncluttered look it gives along with the lack of space most apartments have. Because of lack of light and and space in many apartments in large cities real plants and trees are sometimes not an option so many are going to the artificial version. When trying to get a contemporary look there are many silk plants and trees that will work for this application. Artificial Japanese bamboo trees are a great way to give some height and maintain a clean look. In addition, using our artificial grass matts to fill in planters will give you a well maintained and clean edges either indoors or out. Cedar ball topiaries that don't look too bushy and planted in tall containers give a nice look to any home or patio without clutter. Remember to use angles and clean edges when choosing artificial plants for contemporary decor. Anything with concise corners or rounded edges work well such as squares and circles together in the room will finish off your contemporary decor with style. To view some of our artificial plants for contemporary decor start here. Many business owners are great at running a business, marketing and doing the books however very few have an eye for decorating the very place their customers visit. Taking time to make your office space look warm and inviting is key to converting a possible customer into a lifetime client. Many offices simply do not want the added maintenance associated with real plants as they require unsecured services to come in weekly to water and maintain. This is not only an expense but a security risk as well. Silk plants are increasingly becoming more popular than ever before in office buildings because of the ability to soften edges and make customers feel more relaxed when they visit. The cost savings over time is significant because cleaning the silk plants can be done by your existing janitorial or maid service. Take a look at the realistic looking silk plants we offer by clicking here. Our wedding day is one of the most important days of a bride’s life. You want that fairytale wedding where you have your flower girl or girls throwing hundreds even thousands of rose petals all over the church during the ceremony. But wait, most churches will not let you use real rose petals because of the possibility of staining the carpet not to mention they may cause permanent staining on your beautiful wedding dress. Our realistic silk rose petals are perfect for these situations as they are made with high quality and a natural look in mind. You will be hard pressed to figure out if these are real or not right down to the shape and color. We carry many colors of silk rose petals so you not only can use them during the ceremony but also for your wedding reception décor. Spread them on the tables for added ambiance. Make sure you tell the church that they are artificial. Silk rose petals are not just for that special day when you say "I do", they have many uses that may be something other than your wedding. Try using them to fill a glass vase then place your silk flower arrangement in them. 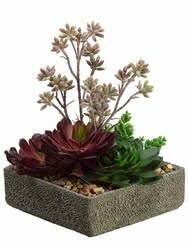 This is a bright alternative to artificial water, sand or dirt to give your arrangement a look of a custom designed piece. Try different colors to match your arrangement. Many people will use them on Valentines day for all kinds of creative things. 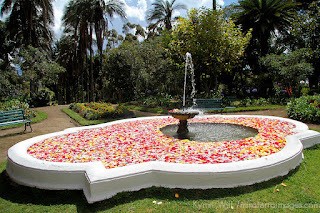 We believe this is such a wide and creative use of silk rose petals that the sky is the limit. Best of all they float, so they can be used to decorate a bathtub on that special day. These petals are so realistic that you can even see the veins in the leaves and even to the touch you'll have a hard time telling if they're fake. Our silk rose petals are not the same as your typical craft store or dsicount ones, purchase just one time from us and you'll know why our customers keep coming back over and over again. 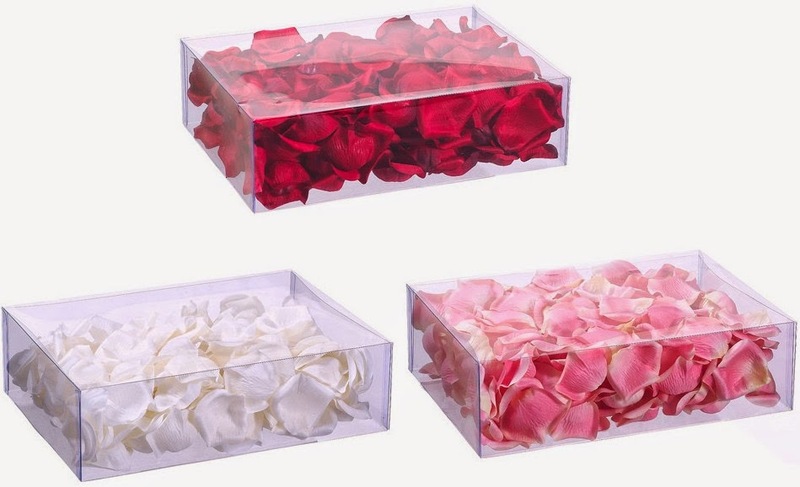 To view our selection of realistic silk rose petals click here. When decorating your home it always helps to warm up the space with artificial palm trees. Interior decorators have used artificial palm trees for years to give a tropical feel that lasts all year long. When decorating with palm trees take into account the height of your ceilings, most homes have 8 foot ceilings which will allow for a 6 to 7 foot palm tree to be adequate. When placing the palm tree in a corner take into account the width of the tree, normally a narrow palm tree will go better in a corner than a wider one. Try using narrow areca palms, phoenix palms or a bamboo palm in these corner areas or where you have limited width as these tend to be narrower. For wider areas, a giant areca or kentia palm will be a good choice as the fronds tend to fan out wider than the areca or bamboo palms. It's natural for the palm leaves to rest up against the wall as this will happen even with real palm trees. Take your time to fan the palm tree out to give the branches a natural curved look which will make it look more realistic. Large planters are typically used with large palm trees giving them a more proportionate look. Adding Moss or ivy around the bottom of the planter gives it a more realistic natural growing look. River rock around the top of the planter is also a great way to give your artificial palm tree a naturally growing look. Spring is creeping up on us and weddings are in the air, beautiful spring colors, fresh air and warmer days are what make spring the most popular time of year for weddings. With the birds chirping and gentle spring breezes blowing many will have their wedding in beautiful blooming floral gardens, while others will bring those gardens inside just in case Mother Nature doesn’t want to cooperate on their special day. Bringing floral gardens inside can be tricky when dealing with live flowers not to mention expensive. A bouquet of flowers can cost in excess of $100 or more depending on the style, size and types of flowers used. When you take in to count how many flowers you’ll need to bring your floral garden inside, it can use up most of your budget for your entire wedding. This is why many brides to be are choosing silk wedding flowers instead of the real counterpart. With today’s technology silk flowers are more realistic looking than ever before. It gives them an indoor floral garden for a fraction of the cost without sacrificing beauty and a big chunk of their budget. Our design department has developed a line of silk wedding flowers that match many styles and colors that are most popular with wedding parties. Browse our selection of wedding bouquets, décor and artificial trees for your wedding reception décor by clicking here. We all love when we have fresh produce in or kitchen as it give you that summer feel. This is all great until the produce starts to decompose and get old, that is if you don't use it first. When decorating your kitchen for the winter many of us tend to get a bit drab when it comes to colors. What many don't think about is incorporating artificial fruit and vegetables into our kitchen decor. Artificial fruit and vegetables can give you that summer look all year long without the problem of the product getting rotten. Many of the artificial fruit in the past has been cheap plastic however with all the new technology available today, artificial fruit and vegetables have evolved. They now come in soft to touch and weighted versions; this gives the fruit not only a lifelike look but also a lifelike feel when you pick it up. Place them in a bowl or basket to ad more realism but don't let your guest take a bite of them because the taste is not so great. If you've ever created your own silk flower arrangement or wanted to change silk flowers in and out of your favorite vase, you know that you can't use acrylic water products. Acrylic water will permanently harden into your vase and when you want to switch flowers, it's impossible to save the vase. We've known about this problem and have looked for a product that can not only give you the look of fresh water but also is re-useable. Craft water is a gel like substance that you can easily mix and pour into your favorite vase then just insert your silk flowers. When you get tired of the flowers or the season changes you can take your flowers out and add new ones. 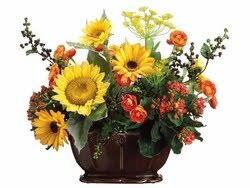 Not every ones decor stays the same so you may want to change the color and style of your arrangements. Craft Water makes it easy to save your vase yet hold your silk flowers in place. Using greenery such as cypress, cedar and shaped boxwoods are a great way to finish off the Tuscan design look. 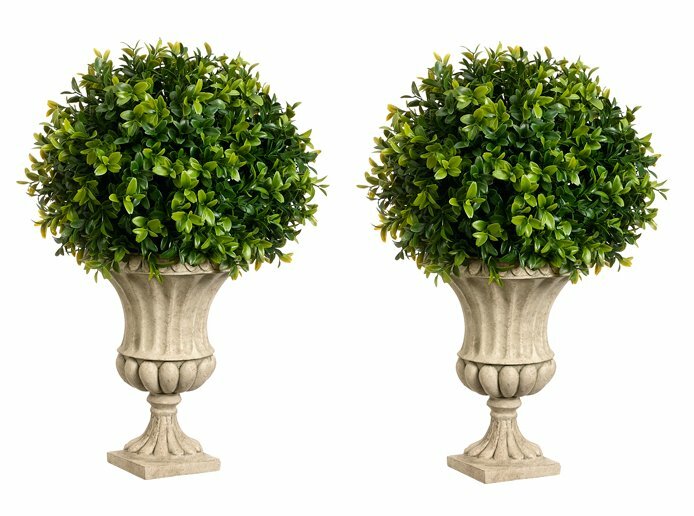 Using urns to plant them in is a great idea however make sure, if they will be placed outdoors, that they have drain holes to keep water from settling in the bottom of the planter. 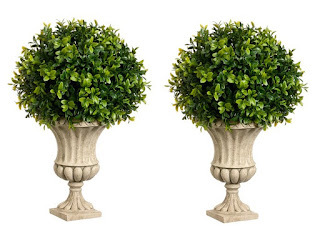 Cone shaped are the most popular for Tuscan design however feel free to use spiral shaped artificial topiaries as they are a staple in Tuscan design. Flowers such as brightly colored gardenias, bougainvilleas, sunflowers and morning glory are all great choices when trying to get a Tuscan style in your home or garden. Wooden planter boxes with some hanging outdoor artificial flowers are great to accent windows and over doorways. If you have a balcony, try adding some pot holders and set clay pots around the balcony with some for the mentioned flower bushes in different colors to brighten up your outdoor space. 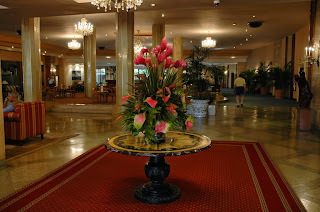 Many of us have been to a high end hotel or at least have seen pictures of them with their beautiful rooms and lobbies filled with what seems to be high end décor. The truth is that many of these hotels are employing professional designers to create the look of elegance. What you don’t know is that these items are offered by us in the smaller home scale versions allowing you to replicate what the high end hotels are creating to wow their guests. First take some time to browse the internet for some creative ideas that the hotels are using. Start with one product at a time such as an artificial flower arrangement and then search our site for something similar and sized for your space. Next move on to the greenery and accents they use to soften edges yet give a nice clean, elegant look. 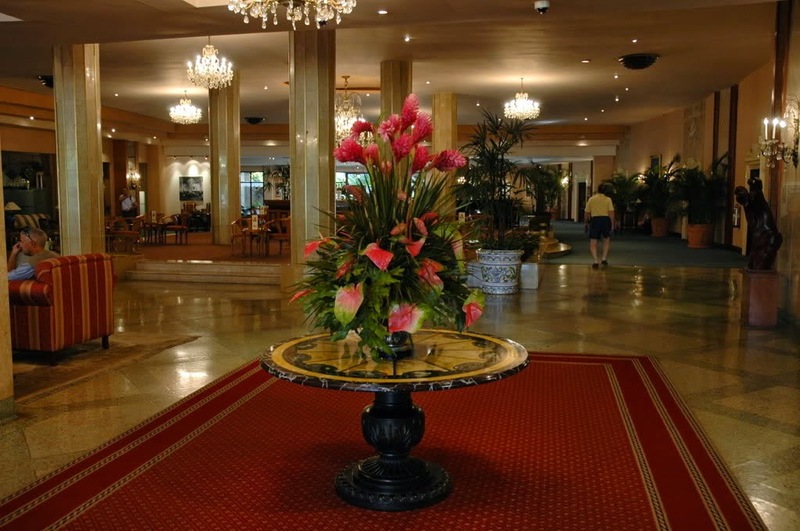 Our elegant arrangements page is a great place to start looking for flower and plant arrangements that are used in the high end hotels and resorts we sell to. If you’re up to it you can try starting from scratch and purchase all the items separately to make your own elegant arrangement that fits your style. All you have to do is look at some of the hotels and office building lobbies to get your inspiration. Have fun and send us your pictures when you’re done and we may feature your design in our blog. Click here to visit our elegant silk flower arrangements page. Walking around at different times of year I’ve noticed that many homes display artificial wreaths on their doors, over their fireplaces and some on the walls in their homes. Each one is usually to celebrate a certain season and can be changed to match the time of year very easily. Interior decorators are using them in their designs to give a room that subtle but yet elegant touch of color and it’s magic. We all know Christmas is a big time for wreaths but there are many types of artificial wreaths you can use throughout the year to give your space a look only a wreath can present. Wreaths date back to ancient Greece and the Pythian games which is now called the Olympic Games. Laurel wreaths were given to the winner of a competition as a symbol of their victory. Golden wreaths were only adorned by royalty. In ancient Celtic times in Europe they used to decorate their homes with boughs of holly wreaths to celebrate the winter solstice and the returning of the sun. This is what we now know today as Christmas wreaths that we hang on our doors. Christmas wreaths are by far the most widely used décor during the holiday season but know many people are using wreaths to decorate their homes all year long. Traditional wreaths were made from real holly, pine or flowers but when they die you have to throw them out. 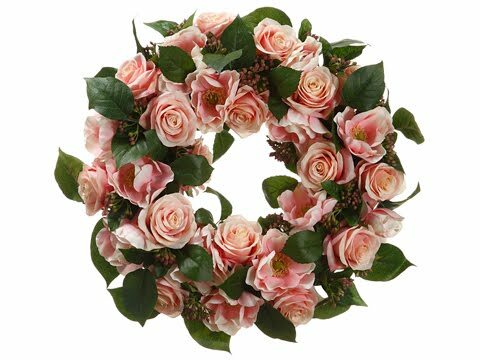 Our newest line of artificial wreaths will last you for many years and will create beauty that not only looks authentic but is easy to maintain. Wreaths can be used for doors, walls, wedding décor or to decorate your cubicle at work where you have limited desk space. They come in different shapes and sizes along with styles of contemporary, traditional or floral style artificial wreaths. Spring and summer is a great time to hang sunflower wreaths, floral wreaths or green plant wreaths. Use orange, burgundy and browns to hang in the fall and winter. Of course don’t forget about Christmas wreaths for your decorating needs in December. Whatever you choose, you won’t go wrong with artificial wreaths because if you ever get tired of it just take it down and replace with another seasonal one, it can’t get any easier than that. Click Here to view our selection of artificial wreaths and silk flower wreaths on sale. With the worst drought since the dust bowl in the thirties more and more people are having a hard time keeping their plants alive. Many have started replacing their indoor plants with artificial versions of the greenery that decorates their home. Until now there have been very limited options for outdoor artificial plants and especially hedges. Many have tried placing the traditional indoor style silk plants around their yard only to find out that they start to fade and turn an ugly blue green color that doesn’t look natural. Since the traditional silk plant is made of silk screened polyester, it will fade after a few months just as if you were to leave your favorite colored shirt outside in the sun for a couple months. This can be expensive along with being ugly if you don’t constantly replace them on a regular basis. There are only a few options for artificial outdoor plants and some are very expensive but below is an inexpensive way to combat this problem. We are now carrying a full line of professional grade to mid grade outdoor artificial plants including palms, bushes, flowers, topiaries and now hedges. If the description says it’s UV inherent or protected then you can take it right out of the box and place it in your yard for enjoyment. If they don’t, then the plant is made of a durable poly blend plastic that will stand up to the elements but will have to be sprayed with a clear coat UV protecting spray that you can purchase for about $11 at your local paint or hardware store. Krylon makes a great product for this and it’s as easy as spray painting the plant with the clear coat and letting it dry. It will keep the plants that are not UV protected keep their color and integrity for years. This little secret can help you get much more usage out of your outdoor artificial plants and in the long term save you hundreds and in some cases thousands of dollars. Office building owners, hotels and property management companies are getting in on this growing trend as the cost to run these facilities are growing higher and higher each year. It makes sense as the maintenance on these plants are basically hosing them off from time to time and the indoor ones are just as easy when you use an artificial plant cleaner to spray on about once a month. It not only beautifies the properties but is also eliminates the need for plant care expenses such as watering and pruning services in turn saving companies thousands of dollars a year. Apartment owners with balconies love these new hedges because it gives them a way to provide privacy in areas where it would be almost impossible to keep real hedges alive. We all know that plants and greenery add softness and a touch of elegance to any home, office or special event and now with the highly requested hedges, we have done it again and solved a problem that has plagued many for years. We will keep looking for new and exciting products in the future and in the mean time you can visit our newest line of outdoor artificial plants by clicking here. 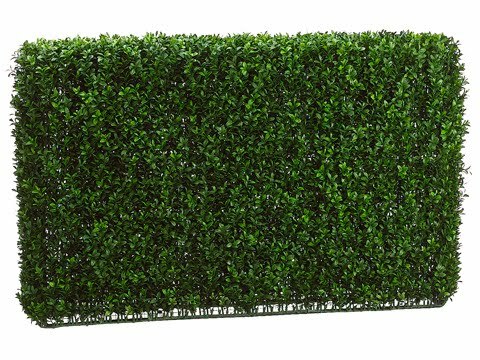 Now featuring our newest plants to our outdoor line, outdoor artificial hedges. These are a great way for those of you that live in apartments or areas where it's hard to keep hedges alive all year long. Also great for office buildings to decorate indoors and out to give your office building or hotel a lush green look without the maintenance of real plants. Our hedges are made from a durable poly blend that will withstand heat and cold. We do recommend using a UV protectant coating to spray them down with if they will be outdoors and in direct sunlight for extended periods of the day. This will help keep them looking fresh and green for much longer than without any UV protectant. 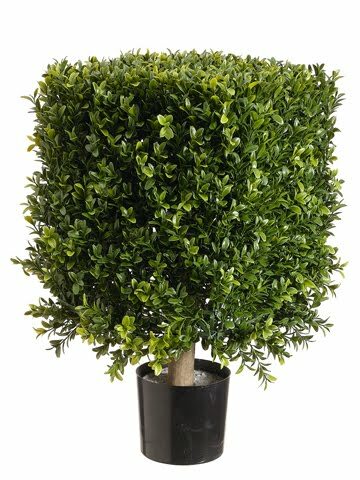 We're carrying a selection of large rectangular artificial boxwood hedges to small square ones that are pre-potted that you can place in a planter around a deck or balcony. There are many uses for these and your imagination is the only limit.